Of course, the festival is officially over now, but its effects may continue for a while. During the afternoon I went up to the Studio to use the space for a teaching related function (cleaning the sand from all the shells I picked up yesterday) and saw Brendan in the upstairs hall. So I asked him if they were pleased with the event. He said absolutely yes. He didn't have exact numbers, but he felt that overall attendance was up, which seems likely, as last year we had snow storms on the first and last days of the festival. He thinks that opportunities for the resident artists will increase, and general interaction among the people in the building. All the people who have been there for years I know, but I met a bunch of new people for the first time this weekend, mostly at the Friday night opening reception. As for opportunities, one such thing from yesterday got a little closer. Had a Studio visit yesterday from someone putting together a small group exhibition with a beach theme, expressing an interest specifically in my boardwalk prints. Today I received an e-mail with an official invitation to be part of the group. This won't be until December, but that's just more time to get something else done. (Names and other details will follow as things get closer.) Yesterday I had a few people suggest the possibility of commissioning prints. Haven't heard from any of them yet, but they all know where to find me. I skipped last night's dinner and variety show, but I was back in the Studio this morning for the brunch and Open Studio event. Got a little later start than I had hoped for, so while I arrived before the official start at 10 am, the main lot was already full. Saw no empty spaces looking up Main, so I moved my car to the back parking lot, which only had Brendan's car at the time. Last year the building took care of the brunch meal, which was fine except for that they ran out of food much faster than they expected. This year they had a caterer doing it. 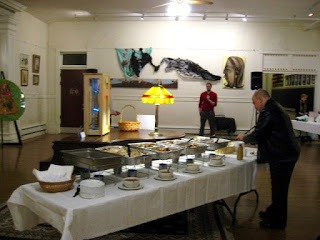 Similar menu- steam tray of scrambled eggs, sausages, bacon (very crispy), cut up melon, potatoes, bagels, danishes, etc. Filled a small plate and took it to one of the tables set up right by my part of the show. As I finished my food the tables started filling up. 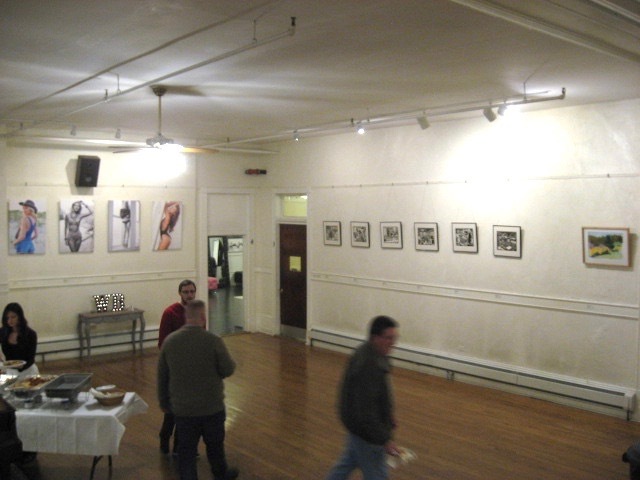 Chatted briefly with some of the people I knew, then headed downstairs to set up for the Studio visitors. I'm sure that the biggest action remained up on the first floor, but I had a steady stream of visitors for the next few hours. 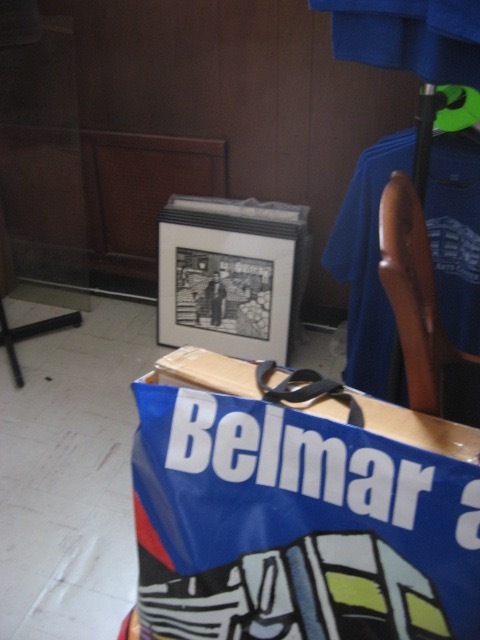 I had brought quite a bit of stuff with me for the occasion- a pile of some of the other supermarket prints not in the show, sketchbooks, the block for the next supermarket print, the half done block for the Asbury themed boardwalk print, my press clippings binder, postcards. I figured if things were slow I'd try to do some more sketching on the blocks, but that never happened. Had a bunch of family members show up. Some people who I had met on Friday were back and made the trip downstairs. A few critique group members were there, some for the building event, and one specifically to see me (woodcut convert Mary, who had more details regarding a furniture building job she has for me, plus wanting to discuss her plans to attend this year SGC out in Portland, a city where she had great fun printing last year.) One person recruited me to be part of shore themed art show late in 2016, with an eye on some boardwalk prints. Answered a lot of questions about the process (woodcut is an obscure concept in the 21st century), and showed many more examples of what I have done. People seemed impressed, both with the technical skill, the level of detail, and with my weird ideas and sense of humor. Can't say with any certainty if anything today will lead to something, but some seeds may take root. By 2:00 pm the crowds were thinning, as the day transitioned from what were were doing to the Open Mic event upstairs, so I started packing up. By 3:00 I had loaded my car and took a ride up to the beach. Still a bit breezy today, but as warm a day as we have had in 2016, so an opportunity to collect more shells for my 3D class this week. Filled a plastic grocery bag with decent sized pieces, which added to ones I collected earlier this year and leftover pieces from the fall semester, means I'm all set. Days like this draw lots of visitors to beach towns, but eventually I was able to work my way out of Ocean Grove and get home. Tonight was the official opening of the 2016 Winter Arts Festival at the Jersey Shore Arts Center, home of my Studio. Last year a combination of Friday night drawing class in Ocean County and snow caused me to miss the opening, which I heard was fairly well attended. Tonight was chilly, but it is expected that we'll be free of snow this weekend. I got to the building about 6:30, allowing me to grab one of the last remaining parking spaces in the lot. I made a quick tour of the first floor- my pieces were now with labels, Molly's installation was finished. Dropped off my bag and coat downstairs in my space, then back up to the show. We ended up with a decent crowd. An e-mail from this morning had mentioned wine and cheese, but we also ended up with quite a bit of catered hot food, including coconut shrimp and a fried artichoke dish, both suitable for a Lenten Friday. Molly actually showed up, and one of our critique group members. Plenty of people to talk to. 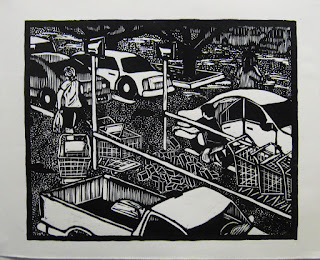 My show got a good reaction- the supermarket prints always do. A couple of people thought that the art was hung too high- my pieces were about 7 feet off the floor. Thanks to my bold graphic style at least people could see what they were about, even if they lost a few details. One suggested I should have the full stories posted on the wall. I don't mind telling them, but I'd rather have viewers look at them and think about the narratives for themselves. 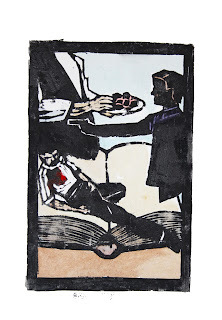 Perhaps I should bring more of the unframed prints on Sunday for the open studio session. People started drifting out around 9 pm, but I am sure we had 50 or 60 pass through. And no snow, so a successful evening. Have a bunch of art stuff going on this coming weekend, so I had to get a start on it tonight. This weekend is the intake for the next show at the BAC, the Hollywood themed show. I'm putting in my hand colored version of the Godfather themed Fourth of July print, having gone through a bunch of steps to get it to this point. The last step before I drop it off on Saturday is to frame it, but this wasn't hard to do. Just last fall I put another hand colored Fourth of July print into a Belmar show (the Halloween/horror show), so it was just a matter of swapping out one for another. Done. Part of the reason I did that tonight was because tomorrow I'll be busy with my part in the Winter Arts Festival in Ocean Grove. The work is all done, including publicizing it, but I will be putting in a number of hours there on Friday and Sunday, representing myself and the Studio. All part of being an artist. About a week away from the Winter Art Festival up at the Studio. I stopped by up there briefly for two reasons. The Sunday of that weekend includes an open studio event, and assuming people make it down to the basement, it's good if they can see something being worked on. It's educational, and seeing those aspects of the process just might encourage a sale or two. One option is to work on the unfinished Asbury Park boardwalk print. Being right there within walking distance of the location could spark some interest, and for people from Asbury Park, nothing is more interesting than Asbury Park. The downside is that what's left to do in that composition is mostly the people on the boardwalk and I have relatively few references to go with that right now. 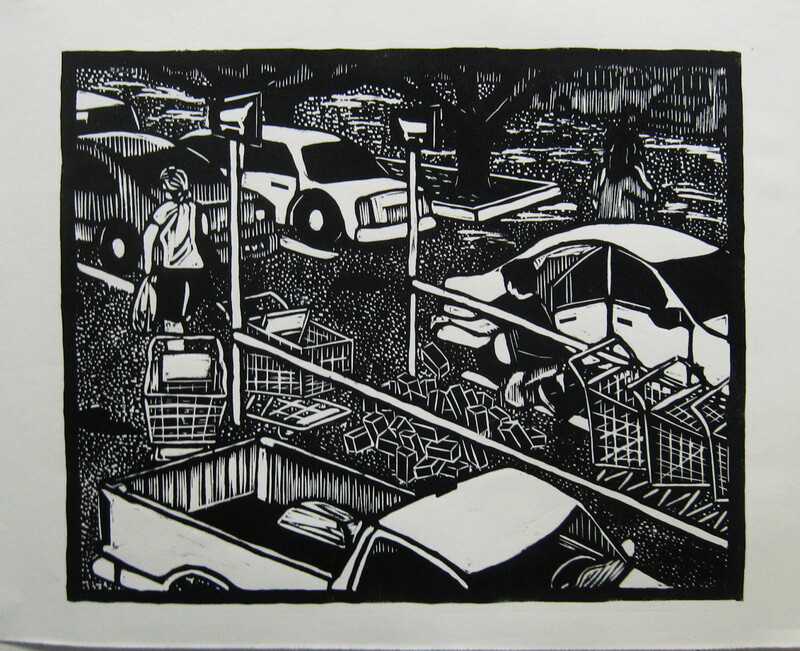 The other option is the next supermarket print, and with those the focus of my show, might be the logical choice. Still in the early stages, but I might work out enough over the next week to start working on the block sketch. Toward that end, today I prepared the block. With the birch I have, that just means cutting it to size. I'll probably bring both with me next weekend. While I was up at the Studio I went up to the first floor. As I was told, my show would be installed today and I wanted to see how it looked. My six are on the same wall as last year, plus one more, probably one of Jackie's pieces. The spacing is good. Molly's wall is still empty and she was working on large wooden piece in the basement hallway. She has until Friday to get if finished and ready to hang. There's a show deadline next week in Belmar, an open type show called Hooray for Hollywood. As I mentioned previously, I didn't think I would have anything for this show, but after considering the Fourth of July set and verifying that I still had one of the blocks (the one about reading the novel of the Godfather over spring break that year), I printed up another copy last week. With the ink mostly dried up it's not a great proof, but I knew I'd be adding color so it would do. This afternoon I was devoting some time to some digital housekeeping- cleaning out some excess old e-mails and junk in my Belmar box, and ran across the notice for tonight's event. The next show in Belmar after the Hollywood one is the annual Juried show, and with there being a history of problems with members not being able to properly photograph their own work for jurying, the BAC organized a free event for members where they could get some tips get a piece shot. Since my photo software is still not operating, I realized this could be a good opportunity to deal with an immediate need. (for that next show I'll be submitting the brick rubble piece- shot to be submitted to last year's show and that jpeg is still on my computer) So I went up to the Studio to color my Godfather print. That time of day the building was pretty empty, but Molly was around, working on something related to her part of the coming Winterfest. We compared notes and then got to our respective tasks. I had spent a few minutes looking at film stills online before coming up, so it was simple select some colors and start applying them. The whole thing was done within the hour. Stopped by the Boatworks on the way home, to verify information about the evening activity. About an hour later I was back for the event. Learned nothing about photographing I didn't already know (been doing this for close to 30 years) and if I had the program I needed on my computer it would have been done in about 10 minutes. I ended up last on the list for the night, but eventually I was taken care of. The image will be e-mailed to me in the coming days, and when it is, I'll also include it here. (and there is is, above) And all this running around to accomplish such a routine task is a good incentive to resolve this for myself. 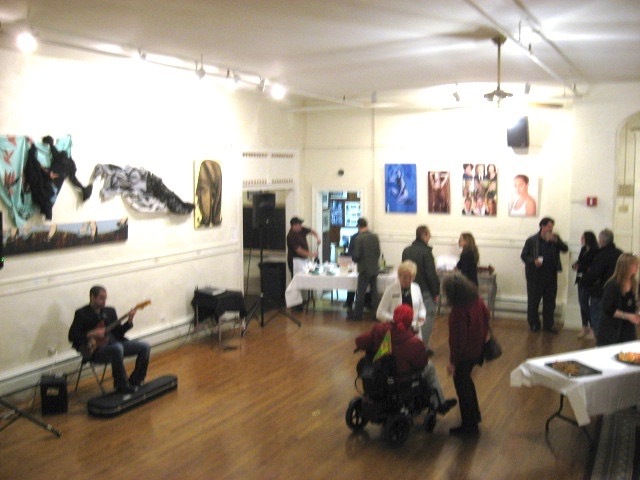 Back in mid-December I got an e-mail announcing the 2nd Annual Winterfest would be coming to the Jersey Shore Arts Center in February. More details to come. Last year I decided to show a selection of medium to large prints, but I have a history of not liking to show the same things in the same places more than once. So thinking about what I have in storage, I decided that this year I'd do a group of supermarket prints. The most recently completed in this series is #23 from last spring, which has never been publicly exhibited before, so I told the organizers they would be debuting a piece in this year's show. The one from last spring about watching a guy dump old brick debris in a supermarket parking lot, seen below. That e-mail from last year had given a delivery date of last weekend, but word came down that the guy in charge wouldn't be in New Jersey at that time. But I dropped by the building yesterday and he was now back, and we made plans for me to bring in my contribution on Friday. I had estimated that 6 framed pieces would be good for about the space I'm expecting and had brought a bunch to my apartment a few weeks ago. I knew I wanted to switch one of the framed prints for the new rubble image, so spent part of last night looking at the ones I had and deciding which one would be changed. So this morning I switched the rubble print with another one (the supermarket liquor store print last seen in the show in Newark last year), and repacked all the prints. Once again the large tote bag I got from the BAC was the ideal solution to moving a large amount of stuff, as it easily held all 6 framed prints, and could be carried by the one set of handles. I took a few minutes at home to gather some details about the pieces, specifically the dates, as the paperwork asked for those. (for the record, these pieces range from 1997 to 2015). After lunch I drove them up to the Studio building, unpacked them in the office (as directed), and filled out the paperwork. Included a brief overview statement, but I've written about or been interviewed about this series enough times that it was easy to knock that out from memory. I'm told I will likely have the same piece of first floor wall I had last year. The 2016 Winter Arts Festival is officially open February 26 to 28, 2016. Last year events were scheduled over 4 days on two weekends, and it snowed 3 of those days. All went on as scheduled and we got a decent turn out considering. The plan for this year is an opening reception on Friday the 26th, an official dinner/variety show with expensive tickets on Saturday, then a brunch/open studio and then open mic poetry event on the Sunday. Except for Saturday evening, all the events are free. How long the art remains up is unknown, but last year they kept it up on the walls until they were ready to decorate for this past Christmas. A rare thing happened last month- we skipped the critique. Just the second time since we started these things. A combination of holidays, semester start, plus whatever Molly may have had going on. After missing the first two weeks we both concluded we'd be better off skipping the rest of January and just waiting until February. The usual Monday didn't work for Molly for whatever reason, but after polling a few people she suggested Thursday. So I put it out there to my list. No positive replies, but several people came through the door tonight, so it all worked out. For the moment I still lack the ability to edit and post photos to the web, so it will just be words tonight. I arrived at the Studio around 5:30, mostly because I needed to do a little printing. The next show in Belmar will have a Hollywood theme. Not one of my priorities, but whenever I'm looking for art about a specific topic I look through my 366 piece Fourth of July series and it's often covered in there. 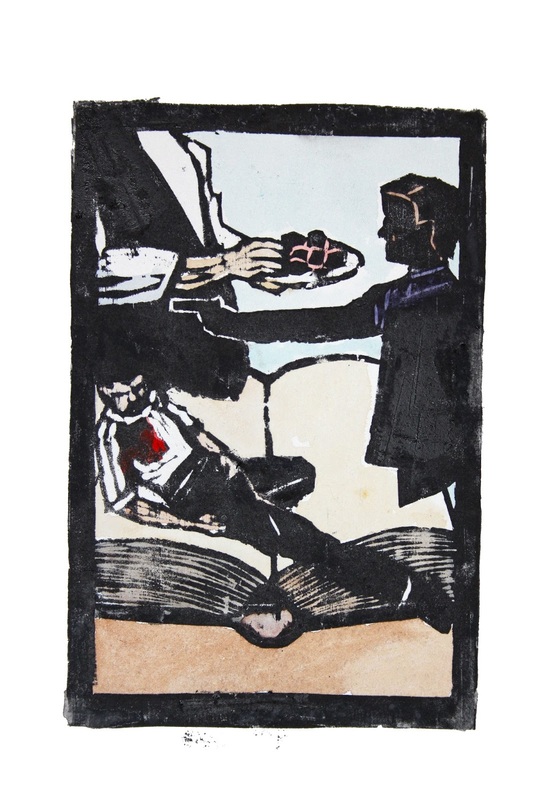 And sure enough I have a piece about using a bit of my Spring Break that year to read the novel version of The Godfather, checked out of the college library. The image I created borrowed things from the film, so this will do. I took a quick proof tonight, and I will eventually go in with some watercolor, maybe a little sepia toned style. I just finished cleaning up when people started to arrive. We had 7 in attendance, 6 of whom had art. I was chosen to go first, which is very unusual, and I opened with the collaborative piece I was working on early this year. The most prominent aspect of it was two birds from Tim, and he was very excited by what I had done with them. I had left an empty space in the upper left corner in case someone else had an idea to add to it, but Tim and everyone else thought it was pretty resolved now. If I had thought it needed more I would have added it myself, so I was fine with calling it done. Showed my Godfather piece, explained the original print story and my plans for the new Hollywood version. From there we went to Jane, who brought some pieces in progress- a pastel portrait of a niece, and two watercolor landscapes. Tim had a large colorful piece, constructed like a collage of small elements. I compared it to a dense urban scene packed with billboards, neon, and colorful store windows, which others agreed with. Molly had the latest version of her turtle piece, now a finished ink on glass drawing ready for conversion to a screen, plus t-shirts of one of last years designs, which she handed out to everyone present. Mary brought a block with what is her largest ever woodcut, a large portrait piece. So far it seems a successful enlargement of a smaller portrait piece, but I look forward to seeing how it works out. Christina had a three dimensional piece, designed like a view through a window in a brick building. So a good evening, good art, good snacks.